Volunteering is increasingly recognized as a significant resource for overcoming development challenges. Empirical data can document the contributions of volunteers, set benchmarks for evaluation, uncover important trends, and encourage policies that help promote volunteering. 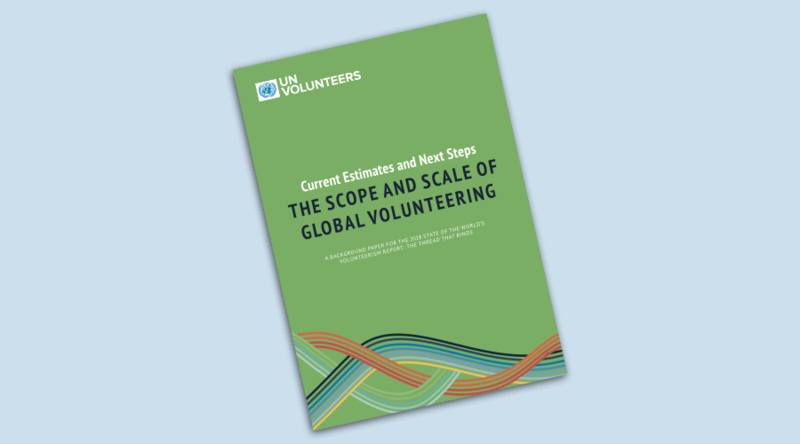 Today, UNV publishes a background paper as part of the 2018 State of the World’s Volunteerism Report project, that assesses the state of measurement of volunteering, and provides new estimations of the scale and scope of volunteering globally. Volunteering is difficult to define and measure in a way that is comparable across borders or cultures. When volunteering has been measured, the focus has largely been on organization-based volunteering, rather than volunteering performed spontaneously and directly between people. Many stakeholders fail to recognize the importance of measuring volunteering, especially irregular volunteering, mainly due to the cost and the diffi­culties of getting a representative sample. Recent improvements have been made to the way in which volunteering is measured. Key references, such as the International Labour Organization’s (ILO) Manual on the Measurement of Volunteer Work (2011) and the standardized definitions adopted in the 19th International Conference of Labour Statisticans (2013), allow for more accurate estimates of the scope and composition of volunteerism worldwide. Drawing on a range of sources to provide comparative data, it is possible to compile information on volunteering in countries covering over 60 per cent of the world’s population and to estimate the scale of volunteering in other countries for which no empirical data is yet available. Using these sources, this paper, written as background research for the 2018 State of the World’s Volunteerism Report, provides new estimates of the scale and scope of volunteering globally. Analysing this collated data, the paper gives insights into global volunteering patterns and makes recommendations to further enrich and expand the measurement of volunteering.